Bless You All! | ¡VidaMaz! https://vidamaz.files.wordpress.com/2018/02/jose-alfredo-jimenez-corrido-de-mazatlan1.mp3 Many thanks to all of you, the opening of my photo exhibition in the Galería Peralta on Thursday night broke the record for most people attending. 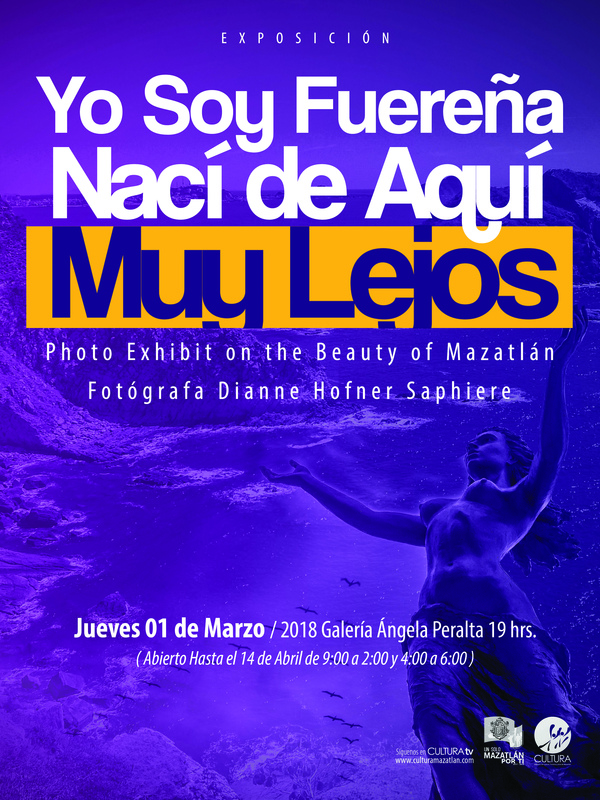 It also signaled the opening of the Temporada Primavera, or Cultura Mazatlán’s Spring Season; my exhibit was the first event, a very nice honor! I was completely overwhelmed with emotion at the outpouring of love and enthusiasm from such a huge crowd. I found it pretty difficult to get a sentence out, I must admit. With nearly 400 people there—a beautiful mix of foreign and local residents—the room got hot and we ran out of both wine and ceviche, and they closed the doors at 8 pm instead of 9 due to the crowd, but I believe most everyone enjoyed themselves. I joked with Greg that had I remembered to ask Padre Juan Jorge to give us a blessing, we would not have run out of wine! The exhibition runs through 12 April, so please if you get a chance stop by the Angela Peralta theater and visit it on the second floor. Be sure to leave me a story or memory in the guest book if you would! The show is based on José Alfredo Jimenez’ “Corrido de Mazatlán,” our iconic Mazatlecan anthem. I so appreciate Licenciado Raúl Rico and his staff at Cultura Mazatlán. From the moment Raúl first invited me to do an exhibit right through to the opening, they were nothing but supportive and wonderful, doing their best to realize my vision for the show. Raúl’s words of introduction were very encouraging. He told those in attendance that he felt my photos express a unique view of Mazatlán, capturing the soul of the place and its people, but from a perspective quite different from the normal. Most of all I appreciate my beloved partner in life, Greg. I am so incredibly blessed to be married to someone so loving and supportive! He usually is with me when I take photos, and has saved me from many buses, a crocodile, and thieves. 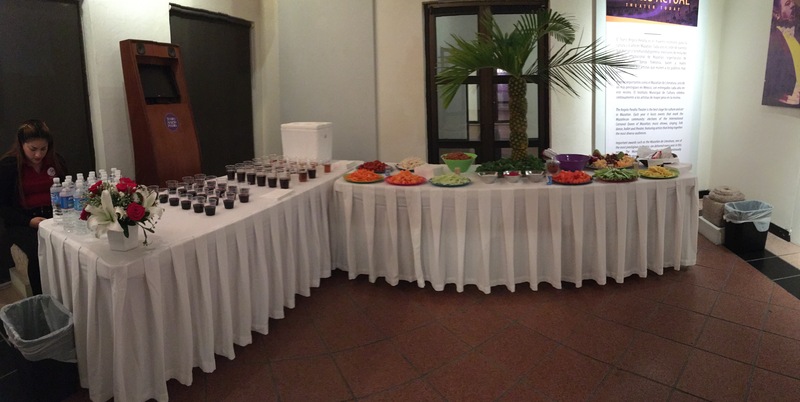 On opening night he made a marvelous palm tree to dress up the refreshments table. I did a lot of media interviews pre-opening, including my first live TV interview in Spanish (yikes! ), and there were loads of media present during the opening as well. I really like the article that Héctor Guardado did in the Noroeste newspaper, because they took photos of many of my subjects standing in front of their photos. Noroeste also interviewed those subjects, which I urged everyone attending the opening to do. Please check it out. I post some of the photos from Noroeste and Cultura below; click on any pic to enlarge or view a slideshow. Mario Martini over at Paralelo23 also wrote a very nice article. I sadly don’t have copies of the television interviews, but here is one from Cultura. Skip that opening thumbnail, please, lol! ← Join My Photo Exhibit! Great work Dianne, and what do you mean yikes, your Spanish is fine! Are you going to sample more of your work in future columns? Thank you, Douglas. I profile my photos on ThruDisEyes.com, and on the Facebook page of that name. But, when it’s Mazatlán-related, I share here on VidaMaz.com, too. So glad you enjoy my work! Thank you for your encouragement!